Special Purpose Impact Sockets Off-Road Budd 13/16" square 1" Drive Ken Tool 30149 / BOWES KT 30149 . Special 1-1/2" hex deep heavy-duty impact socket designed for outer cap nuts on Budd-style truck wheels. The 1-1/2" hex depth is limited to help prevent socket contact with the wheel. 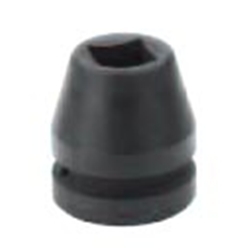 The socket is deep style to eliminate contact with the inner cap nut. Imported.